US, 1981, 115 minutes, Colour. Paul Newman, Sally Field, Josef Sommer, Bob Balaban, Don Hood, Barry Primus, Melinda Dillon, Luther Adler, Wilford Brimley. Directed by Sydney Pollack. Absence of malice is an interesting social drama. It received Oscar nominations for Best Screenplay and for the performances of Paul Newman and Melinda Dillon. The film dramatises the invasion of an individual's privacy by the police and the press. The film dramatises the debate about individual rights and the rights of society, especially to information. The press is criticised for its relentless seeking out of what it calls facts and the truth and its lack of scruple in presenting these. The film also criticises the F.B.I. for its usurping powers and putting itself above the law. Sally Field as the journalist, a mixture of strengths and floundering, excellently portrays the dilemmas of the professional journalist. 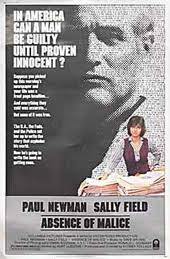 Paul Newman gives strength to the character of the victim who eventually outmanoeuvres his opponents and forces them to confess. There is a very good supporting cast with Melinda Dillon and Wilford Brimley standing out as the final presider at a judicial inquiry. The film was directed by Sydney Pollack who has made a number of strong-themed dramas ranging from They Shoot Horses, Don't They to outdoor films like Jeremiah Johnson to popular dramas as The Way We Were, Bobby Deerfield. 1. An interesting drama? Exploration of social issues? Portrait of human beings and conflict? Its appeal to American audiences? Universal appeal? 2. The film as a piece of Americana? The Florida and Miami settings? Freedom of the press, constitutional freedoms? The role of the police? The F.B.I.? Union and industrial issues? The tradition of violence? The background of wealthy American families and gangster and prison associations? Schools? The atmosphere of Miami,, colour photography? Editing and pace? The score? 3. The focus of the title? Its legal significance? Irony? The contrast with malice aforethought? The effect of absence of malice and its legal application and administration? The role of law. morality? 4. Society and its being protected by the law? The administrators of the law not being above it? The difference between law and morality? The letter of the law and understanding human circumstances and complexity of motivation? Society's rights, individual's rights? The right to privacy? The right of the public to information? Decisions and the exercise of responsibility for these rights? 5. The atmosphere of journalism and newspaper production? The credit sequences and the preparations of pages for printing? The return to production sequences throughout the film? The work going into the production of a paper? The editorial rooms and methods? The contrast with the casual delivery of papers to homes? The dramatic use of these sequences, especially for Theresa and her suicide? The world of the journalist and investigation? Tape recorders, surveillance, cameras, typewriters? Decisions as to what to print, how to word articles? Legal aid? 6. The comparison with the world of the police? The dossiers on private individuals and the possibility of carrying out investigations? Special squads and special powers? The role of the F.B.I. in the States and in the cities? The District Attorney's responsibility and office? The film's highlighting sound methods and questionable methods? Files and leaks? Surveillance by following. photography, phone-tapping? Authorisation of these means? The rivalries between special investigating groups? Making assumptions and presuming authority? Elliot Rosen and the intense commitment to his work? Pressure for answers? His taking his responsibility too seriously? Usurping his powers? His influencing his aides to act accordingly? His final exposure? His refusal to resign and his being fired? Robert as his assistant? Putting Rosen's commands into action? The complexity of his relationship with Megan? The watching of the Gallagher funeral films? Authorising the photographer to follow Megan? Tapping Gallagher's phone? The construction of hypotheses and the assumption that this was reality? Secrecy? The contrast with the District Attorney's office, the campaign for a Better Miami? Deals, the exchange of money, clashes and mutual investigation? Resignations as honourable means of opting out? The contrast with the role of the Judicial Inquirer at the end? His blunt setting out of the issues, his willingness to talk all day, his assessing the responsibility of each character, acting on the results? Ultimately justice being done and being seen to be done? 7. The film's focus on Megan and Sally Field's screen presence? An ordinary talented reporter? Her devotion to her work? An independent woman? Her relationship with Robert and its cooling? Her curiosity about the Gallagher case? Her trying to make something more of it than appeared? Trying to get information from the police? Authorisation by the editor? The contact with Rosen? His leaving the file for her to examine? Her publishing of the article and her shock when confronted by Gallagher? Her taking the tape on his boat and being followed by the photographer? Gallagher's exposing the tape? The gradual interest in Gallagher? Clashes? Her change of heart? The dinner and her drinking and telling funny stories? Her asserting her independence and women's liberation attitudes towards him? The build-up to a relationship, the affair? Theresa's meeting her and her response merely as a journalist rather than as a woman, human sympathy? The publishing of the article? The communication of the news of Theresa's suicide as she (Megan) typed? Her visit to Michael Gallagher and his brutal reaction? His later apology? Her still being suspicious of Gallagher? Robert feeding her the story? Her printing the article? Trapped by her own ambition? Her participation in the inquiry? Her refusing to name Robert of ethical and professional grounds? Her wanting to confess at the end? The final encounter with Gallagher and the possibility of their meeting again later? Love? Her trying to do her job well, her not realising the implications, floundering? Her skills but doing the job badly? A perceptive portrait of the strengths and weaknesses of a reporter? 8. Michael Gallagher and Paul Newman's presence and style? The family background? His work? His being named and pressurised by Rosen for the investigation? His confrontation of Megan at the office? The meal on the boat and the clash? The meal together? His trying to find out her source for her story? His encounters with Theresa and the truth about the visit to Atlanta? His wanting to protect her? The complexity of the strikes? The closed business? His being under F.B.I. surveillance? The importance of his telling his story to Megan? His father and gangster associations, good business? The story about being locked up for three days and experiencing what thieves experience in jail? His love for Megan? Suspicions of her? The deal with the D.A. after Megan gave him the information about Rosen? His setting up the D.A., the getting of the cheques from the bank, knowing that he was under surveillance? His not wanting Megan to spread the story but knowing that she would? His presence at the investigation? The irony of his setting up police and press in the way that he had manoeuvred him? Audiences deploring his being the victim? Cheering his oneupmanship? 9. The sketch of Theresa and Melinda Dillon's Oscar-nominated performance? At the school, smoking in the toilet, her discussion with Michael and her dilemma about telling the truth for his sake? The encounter with Megan and her nervousness? The gradual revelation of the truth and the abortion? Her waiting for the paper? The pathos of her death? Its effect on Megan, Michael? 10. The character sketch of Rosen and his intensity in his job? His arrogance and love of power? His justifying his actions as an administrator of the law? Robert and the more human touch? The motivation for his seeing Megan and giving her the information and showing her the photos? The District Attorney and his pomposity? His not grasping the realities and his having to resign? The head of the judicial inquiry and his wisdom, humanity, fair conducting of the case with strength? 11. The gangster backgrounds and the connections? Michael's visits to his uncle? The uncle amused by the newspaper exposes? 12. The themes of social evil, individuals getting caught in evil webs? The ordinary details of meals, funerals etc. and the background of the complex power games? 13. The film's exploration of human rights ? society's, individuals'? The exercise of rights? Abuse of rights and people being hurt? 14. Themes of newspaper reporting, responsibility, the difference between truth and accuracy? The vitality of a newspaper and its social role? Legal protection? 15. A satisfying blend of criticism of society? The offering of leads for answers?